That’s the Vigna del Fiore, literally the “vineyard of the flower” (above), the Fattoria dei Barbi’s top cru and the site of one of the best growing zones in the entire Brunello di Montalcino. It’s one of the southernmost vineyards in the appellation and it is surrounded by woods, making it a prized area for the cultivation of Sangiovese grapes that will become Brunello. Note the vineyard’s southern-facing slope, which gives it excellent exposure for the ripening of the grapes. But note also how the vineyard is shaded. The photo above was taken in the late afternoon when the hills begin to block the sun. This helps to cool the vineyard when others might be “baking” in the hot sun during the late afternoon and it creates the ideal conditions for temperature variation: Warm days tempered by cool afternoons and evenings are exactly what the winemaker needs in order to produce wines that a fresh on the palate and high in acidity while maintaining rich tannic structure. 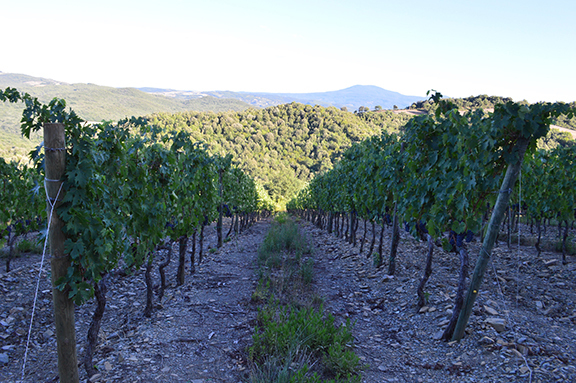 Montalcino is poised to have one of the best vintages of the decade, perhaps even better than the highly heralded 2010. We are looking forward to sharing winemaker Stefano Cinelli Colombini’s notes on vintage and vinification shortly. In the meantime, he’s in the throes of harvest. Stay tuned!